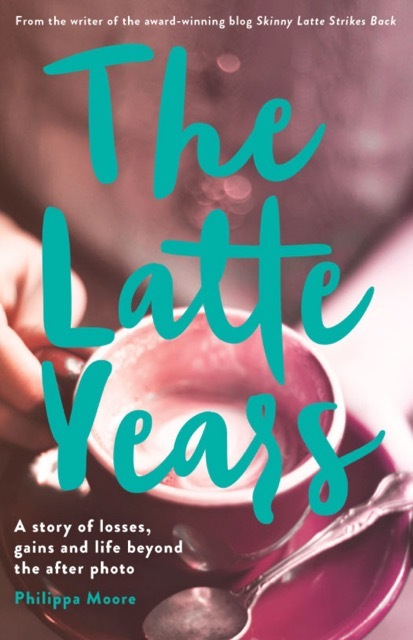 Philippa Moore is the author of the memoir The Latte Years (Nero Books, 2016) as well as a journalist and award-winning blogger. 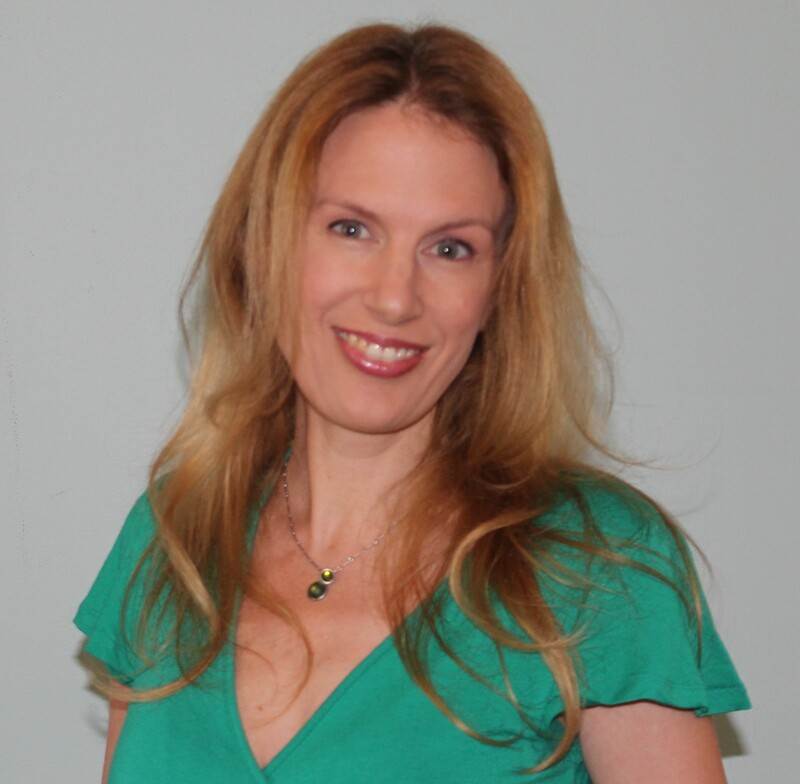 She has written for various publications in Australia and the UK including Cosmopolitan, CLEO, Elle, Running Fitness, Women’s Running and many others. 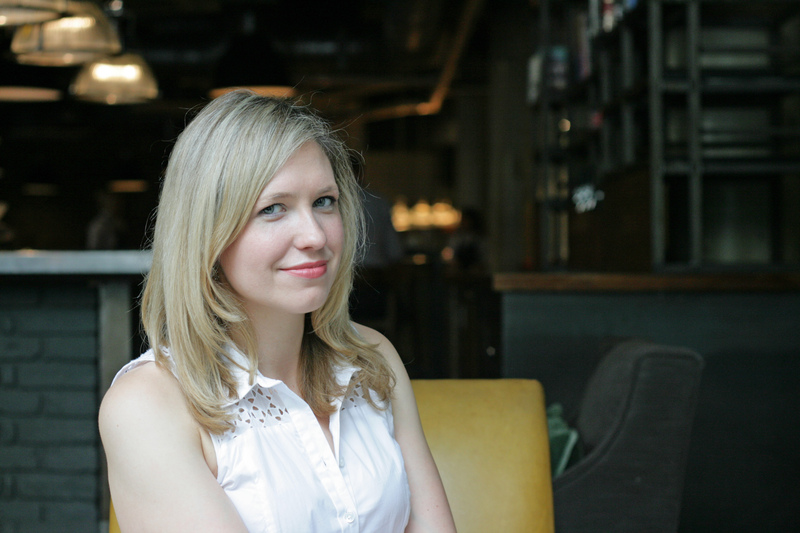 Born in Hobart, Tasmania, Philippa lived in Melbourne for a time before relocating to London in her mid-twenties in search of adventure. Nearly ten years on, she still lives there with her husband Tom. As well as writing and reading, Philippa loves to travel and is usually in the midst of planning her next expedition. I was absolutely book-mad as a child and loved reading and being read to. Once I figured out that books were actually written by people – not magically put together by elves – I decided I rather liked the idea of doing it myself. But it’s all very well to have a childhood fantasy of being a writer – making it a reality has been something else entirely. Ironically for someone who became a journalist and blogger, non-fiction never interested me when I was younger – I was always writing fiction, poetry or scripts. At university, a script I wrote won the University of Tasmania’s one act play competition in my second year. To my older self’s frustration, I didn’t take advantage of that and it was the last thing I wrote until 2005 when I was 24 and I moved from Hobart to Melbourne where, having begun to emerge from my writing exile, I decided to start a blog. It was a very small decision that completely changed my life and got my writing career started. My book’s title pays homage to my blog, as I don’t know where I would be without it. Blogging gave me a voice, an audience, and visibility beyond my wildest dreams, and put me in the path of many wonderful people who have helped and encouraged me along the way. My first book has just been published, so the promotion of that has been taking up most of my time lately! It’s the story of a very drastic personal transformation I went through in my early and mid-twenties which began simply enough – an overweight and unhappy girl decides to take control and start shifting the kilos. But as the weight came off, I realised that it had merely been a symptom of deeper dissatisfaction with my life and that was what really needed to change. 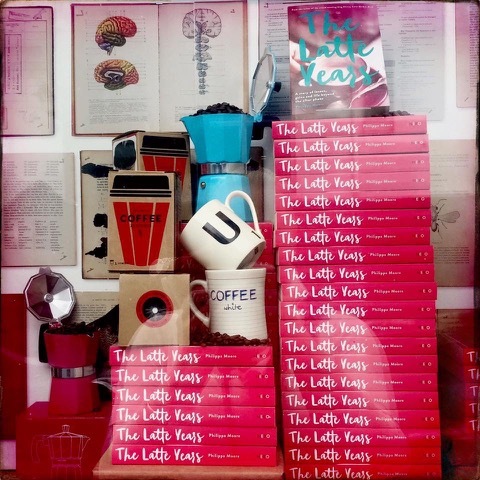 The Latte Years is the story of that journey and the lessons I learned moving beyond the ‘after photo’. The Latte Years is not just about changing your relationship with food and your body, it’s about going through a divorce in your twenties; starting afresh in a new city and a new country; the joys and pains of friendships; learning how to love and trust again after you’ve been hurt; the dark side of success; the search for happiness, freedom and empowerment and how you can find all those things in the most unexpected places. It’s the book I wish had been around for me when I was 25 and going through all of the above! For years I had to write on my bed or at the dining room table, but at the moment I’m fortunate enough to have a separate study at home, which I love and never take for granted! My desk is filled with inspirational flotsam and jetsam of my latest writing project, a vision board filled with motivational quotes and images, chocolate in the drawer, and a gorgeous Marmite jar from the Queen’s Jubilee year (though I am a Vegemite girl, of course) that I use for storing my pens. My MacBook Pro takes centre stage. 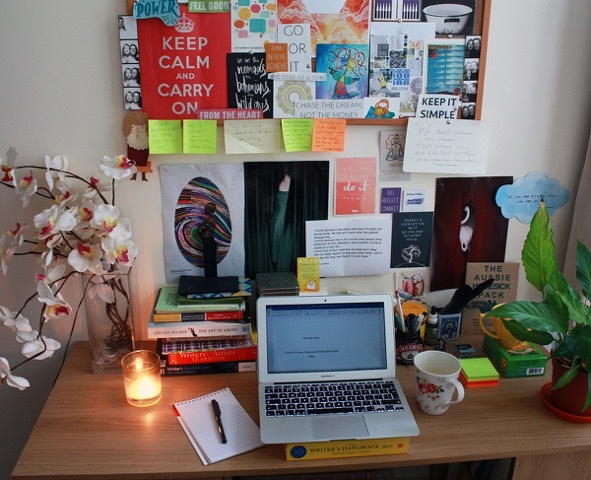 I also always have an oil burner or a scented candle nearby – I love citrus or woody scents burning while I write. Scent is quite a powerful creative trigger for me. I would love to write full time but the pesky practicalities of adult life mean I currently have a full-time day job too, which makes things challenging at times but certainly not impossible! It’s all a matter of priorities. I worked full time while I was writing The Latte Years, and I had a very tight deadline to deliver the first draft of the manuscript – just under three months. To make that deadline I employed the same tactic I used to train for the London Marathon in the same timeframe – prioritise and get up early! I was up and writing by 6am every day before work. I also wrote in the evenings and in 10-hour chunks at weekends. Thank goodness for supportive husbands who make excellent coffee. At the moment, things are a little more relaxed with my writing routine. I’m researching for my next book, which I’m really enjoying, and it doesn’t feel like work at all! I try to do Morning Pages each day – I hate doing them but, annoyingly, they do seem to work. It’s great to get all the dross out of your head each morning so then later on in the day, ideas come swooshing in and you’ve got the brain power to catch them before they fly off. I mostly write in the evenings now but I would like to get back into the routine of 6am writing before work. I was tired but I felt so productive. I think I’d describe it as a curious mixture of being disciplined/practical and creative/emotional, which pretty much sums me up as a person too! In general, I am a collector of ideas and words. I always have a journal or notebook on me where I scribble down thoughts, snatches of conversation that I overhear, observations as I’ve gone about my day. It’s always amusing to read back over these, whether I end up using them or not. I like to let ideas and projects ferment and mature, but having a deadline, even just a self-imposed one, works wonders. I also get very caught up in my work when I’m on a roll – I’ve had days where I’ve forgotten to eat. So that’s where the being disciplined/practical side of my process has to kick in. I’m a very brutal and ruthless editor when I have to be. I’m also a bit of a method writer – when I write fiction, I like to live in my character’s world to give it authenticity. When I wrote my memoir, I mentally put myself back into my old life and tried to write from that place, which admittedly became a bit overwhelming. I recall one particular day, when I’d been writing for about eight hours, and my husband came into the study to bring me a cup of tea. I didn’t recognise him at first, because I didn’t know him during the period I was writing about! While that was a bit of a shock, it also gave me hope that what I was writing was going to be quite powerful and real. Writing, for me, is an all-consuming, exhilarating, powerful, exciting, frustrating, and occasionally even heart-breaking, ride. Perhaps I could reign in the more intense parts of my process, but then maybe I wouldn’t be me. I truly believe everyone’s story is valuable and we all have the right to tell our stories. I’ve learned, in the course of my life and my writing career, that a woman being bold, honest and brave with her life is still considered a somewhat radical (and even scandalous) thing in some quarters, so that’s why I keep going, however unpleasant the attempts to silence me have been. I write, as Natalie Goldberg put it, because there are stories people have forgotten to tell. And because I want to help other women stand up and be brave with their lives and share their stories too. Pretty much everything inspires me! I’m one of those writers who feels constantly flooded with impressions and ideas. The world fascinates me. I love to travel, it always stimulates me and gives me new ideas. There really are stories everywhere – I find people so interesting. And people who are fearless and brave with their lives are my biggest inspiration of all. Telling authentic and honest stories is why I do what I do – but it’s also the hardest part of what I do. Putting yourself out there is not easy. Even after writing a memoir about being brave and believing in yourself, I still have to work on those things pretty much every day. Any issue I have with my writing usually comes down to self-doubt. It’s the reason I don’t hit ‘publish’ on a blog post or abandon an idea that isn’t forming as brilliantly on the page as it did in my head. It’s ironic that some of my deepest fears in life are judgment and public ridicule, and yet I’ve chosen a path where I constantly have to be vulnerable. It’s clearly what I’m here to learn! I wish I had learned to be more resilient earlier on, but that only came with experience! I also wish I’d just gone for it a lot earlier and believed in myself. Instead, I waited for a very long time for permission, for the world to ask me to tell my stories. I finally woke up and realised the world wasn’t going to give me a thing – I just had to be brave enough to believe that what I wanted to say was worth sharing. I also wish I’d relaxed a bit more, trusted myself and the process. I now know that everything always happens exactly as it’s meant to – it’s like the twist in a plot that you don’t see coming but once it happens, you can’t imagine the story working out any other way. I want to keep sharing stories of brave women doing their thing – be it in fiction or non-fiction, whether it’s things I’ve experienced or completely imagined. I want to keep talking about the things no one else does. To keep pushing myself. To produce work that others find valuable and comforting, that helps them think about their lives and themselves in a different way. Oh wow, where do I begin? George Eliot, Jane Austen, Dani Shapiro, Nikki Gemmell, Danielle Wood, Heather Rose, Sylvia Plath, Natalie Goldberg, Madeleine St. John, Georgia Blain, Cate Kennedy, Amanda Curtin, Kate Morton, Elizabeth Gilbert, Isla Dewar, Lisa Jewell, Nora Ephron, Stella Newman, Anna Funder, Tessa Kiros, Elizabeth Jane Howard…. I would buy a book about paint drying if it had any of these names on the cover. And this is just scratching the surface. I could go on and on! Thanks for the great interview, Nicole and Phillipa. It’s refreshing to hear of the solid discipline that goes into creating a book – 6am starts and morning pages – love it!